In a column for the The Wall Street Journal, Holman Jenkins claimed that unemployment insurance and Social Security disability payments encourage recipients to "leav[e] it to someone else to be productive," a claim that economic research and data prove incorrect. According to Jenkins, "our massive expansion of unemployment and disability subsidies over the past four years" is discouraging the people who would otherwise build the technologies that "will save us from the Soylent Green solution to an aging society." Conservatives arguing that these benefits make people lazy is nothing new, but their claims are still incorrect and unsupported by data. With disability payments, the argument is laughable on its face; people collect disability because they are unable to work. It is the disability, not the payments for it, that prevents these people from contributing to the labor supply. Social Security Administration data show the average disabled worker in the program receives less than $14,000 per year, $9,000 below the poverty line and an unlikely incentive for the malingerers Jenkins is looking to scapegoat. And as Media Matters has noted, the eligibility criteria for disability benefits programs are stringent, and the upward trend in the number of disability recipients dates to a Reagan-era liberalization of the program. Jenkins is on similarly untenable ground when it comes to unemployment insurance. Conservatives frequently cite economist Larry Katz to argue that unemployment insurance begets unemployment -- but Katz himself has said that his work isn't applicable in today's economy. 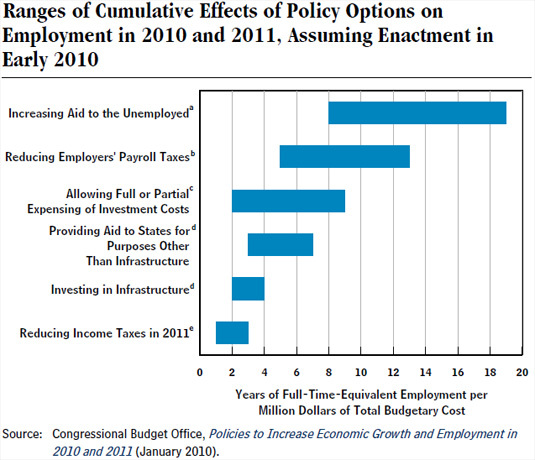 Other research also indicates that UI spending doesn't substantially increase unemployment. Meanwhile, the stimulative effect of unemployment insurance on the economy is well established. And since the Department of Labor data show the average UI recipient gets just $300 per week, before taxes, conservatives making this claim are saying that many Americans would rather live on less than $16,000 a year than work a shovel-- or in Jenkins' case, than build a robot. Finally, if Jenkins is concerned about the amount of labor Americans are willing to supply, he need not be. Based on a monthly survey known as JOLTS -- the Job Openings and Labor Turnover Survey -- the Bureau of Labor Statistics calculates the ratio of unemployed persons per job opening. The latest report found 3.3 unemployed Americans for every open job as of October. Even prior to the recession (shown with gray shading in BLS's chart below) the ratio was above 1. On America's Newsroom, Fox Business host Stuart Varney ignored key economic data in claiming that the December jobs report is proof of "a new normal, bumping along the bottom, settling for this high rate of unemployment, 7.8 percent." Varney began the segment by warning that "you can spin it any which way, but the fact is, this is a weak report," and ended it by claiming that tax increases assure that high jobless rates are "the new normal." But Varney's assertion is spin as well, based on a myopic reading of economic data -- Varney and other conservatives who proclaim high unemployment the "new normal" ignore three discrete piles of information that undermine their claim. The above chart measures from the first full month of each man's presidency. Despite beginning in a deeper economic hole, the beginning of the Obama recovery was marked by a faster turnaround and stronger overall growth in the private sector. By another metric -- annual averages for private-sector job gains -- this "new normal" is also superior to Bush's old normal. This is true whether one counts their full terms in office, or just the years in which the private sector posted annual gains. And it is hardly evidence of a horrifying "new normal" of "bumping along the bottom" due to taxation. In response to a compromise on tax policy, conservative media are again comparing the United States to Greece. According to right-wing logic, the deal brings America even closer to the violence and discord in Greece, Italy, Ireland, France, and just about every European country whose citizens have protested austerity measures. Instead of helping viewers understand the substance and real-world impacts of year-end budget negotiations, television news outlets are shutting economists out of their coverage and relying on political journalists to answer a less important question: Who's winning? A study released Thursday found that cable and broadcast news organizations brought actual economists on air just 22 times in 337 segments on the negotiations from November 7 to 28, effectively barring economics from the conversation. Viewers without cable missed economic experts completely, as ABC, CBS and NBC failed to include them in dozens of segments. Taxes and spending cuts were mentioned in many of the approximately 80 percent of segments that failed to discuss real-world economic impacts of austerity, but only in the context of figuring out which side has the upper hand in negotiations. Correspondents focused on how the day's inside-the-beltway developments impacted the likelihood of a deal or speculated on the political palatability of a deal for each party. The November 26 edition of Fox News' Special Report, for example, featured back-to-back reports on the day's negotiating maneuvers, highlighting that various GOP legislators may defy Grover Norquist's Americans for Tax Reform pledge and various developments in the budget talks made by both parties. However, neither segment discussed broader economic implications. On the November 7 edition of CBS' Evening News, reporter Wyatt Andrews said Speaker John Boehner (R-OH) had "started a public negotiation with the President," and that President Obama's stance on taxes "was his core argument in the campaign," but that Boehner failed to "sell Republicans on that upper income tax increase" in 2011. A followup segment with CBS' John Dickerson focused exclusively on how the election might have changed the two parties' "motivations," and "political fortunes." Neither segment mentioned economic impacts. In recent weeks, media outlets have focused heavily on current budget negotiations regarding automatic tax hikes and spending cuts set to take effect on January 1, 2013 if an alternative agreement is not reached. But major television news outlets are inadequately reporting on year-end budget negotiations, rarely hosting economists and favoring inflammatory rhetoric about the so-called "fiscal cliff," according to a Media Matters analysis. Furthermore, most television segments have completely ignored the possible economic effects of potential tax increases and spending cuts.